Wow! Looking for a private resort for your family? Love the outdoors? Love watersports? You have found the right vacation destination with “Bay Dreaming”. It is a dream come true! This lovely 4 bedroom vacation rental is situated on 2 lots, with a huge, lush yard, a fenced back yard with private pool, a covered portico relaxation station and a separate garage rec room! The Garage Rec Room has a Half Bath, Games, Commercial Ice Maker and Full Size Refrigerator convenient to the Private Pool. Bring the Jet Ski's, kayaks and paddle boards because “Bay Dreaming” sits right on a canal leading to Back Bay! A dock perfect for sunning or onboarding to your watercraft of choice is at the head of a picturesque canal lined by well-kept homes and offering sunsets over the trees in the evening. NOTE: OWNER HAS PERSONAL WATERCRAFT LOCKED AND SECURED. NOT FOR GUEST USE. The Great Room has room for everyone and a wall of windows with water view overlooking the dock and canal. The dining room has a table that seats 14 minimum, with deck access and water view. Bedrooms on top two levels all have water view. Located on the bayside, you can bike, jog or run for miles without having to risk a busy street. Spend your week in a quiet, quaint beach neighborhood. Of course you will want to go to the beach! There is a beach access at the end of the almost 3000 feet walk or just take advantage of all the free street parking available at this end of Sandbridge. Join the locals and enjoy the walk to the beach! Top-Level: King Master with Roku TV (no cable), Deck Access with Water View, Whirlpool, Shower, 2 sink Vanity. Ground-Level: Queen Bedroom with Daybed and LCD TV and Direct Access to the Private Pool Area, Hall Bathroom, Laundry Room with Washer, Dryer and Laundry Sink, Full Size Refrigerator, Covered Porch. Pool Area, Garage Rec Room with Queen Futon and Queen Sleeper Sofa, Wet Bar, Commercial Icemaker, full Size Refrigerator, Blue Tooth Speaker, Game Table, Half Bathroom. Extras: Private Pool (30 x 16), Wireless Internet Access, 3 Full Size Refrigerators, Dock, No Smoking, Dogs Allowed, Parking: 4 Cars, Distance to the Beach: 3010 ft. Private pools are open from May 3, 2019 until October 6, 2019. This property is not equipped for pool heat. Pool heat is not an option for this property. Owner has personal watercraft locked and secured (not for guest use). Fireplace seen in photos is non-functioning and not available for use. Wow! Looking for a private resort for your family? Love the outdoors? Love watersports? You have found the right vacation destination with “Bay Dreaming”. It is a dream come true! This lovely 4 bedroom vacation rental is situated on 2 lots, with a huge, lush yard, a fenced back yard with private pool, a covered portico relaxation station and a separate garage rec room! The Garage Rec Room has a Half Bath, Games, Commercial Ice Maker and Full Size Refrigerator convenient to the Private Pool. Bring the Jet Ski's, kayaks and paddle boards because “Bay Dreaming” sits right on a canal leading to Back Bay! A dock perfect for sunning or onboarding to your watercraft of choice is at the head of a picturesque canal lined by well-kept homes and offering sunsets over the trees in the evening. NOTE: OWNER HAS PERSONAL WATERCRAFT LOCKED AND SECURED. NOT FOR GUEST USE. The Great Room has room for everyone and a wall of windows with water view overlooking the dock and canal. The dining room has a table that seats 14 minimum, with deck access and water view. Bedrooms on top two levels all have water view. Located on the bayside, you can bike, jog or run for miles without having to risk a busy street. Spend your week in a quiet, quaint beach neighborhood. Of course you will want to go to the beach! There is a beach access at the end of the almost 3000 feet walk or just take advantage of all the free street parking available at this end of Sandbridge. Join the locals and enjoy the walk to the beach! Top-Level: King Master with Roku TV (no cable), Deck Access with Water View, Whirlpool, Shower, 2 sink Vanity. Mid-Level: Great Room with Smart TV, Kitchen with Granite, Stainless Steel Appliances, Center Island has Work Station, Storage, Seats 4, Dining Room Table seats 14, Deck Access with Water View, Queen Bedroom with Daybed, LCD TV and Deck Access with Water View; Bedroom with 2 Bunk Beds, LCD TV and Water View; Hall Bathroom Ground-Level: Queen Bedroom with Daybed and LCD TV and Direct Access to the Private Pool Area, Hall Bathroom, Laundry Room with Washer, Dryer and Laundry Sink, Full Size Refrigerator, Covered Porch. Pool Area, Garage Rec Room with Queen Futon and Queen Sleeper Sofa, Wet Bar, Commercial Icemaker, full Size Refrigerator, Blue Tooth Speaker, Game Table, Half Bathroom. 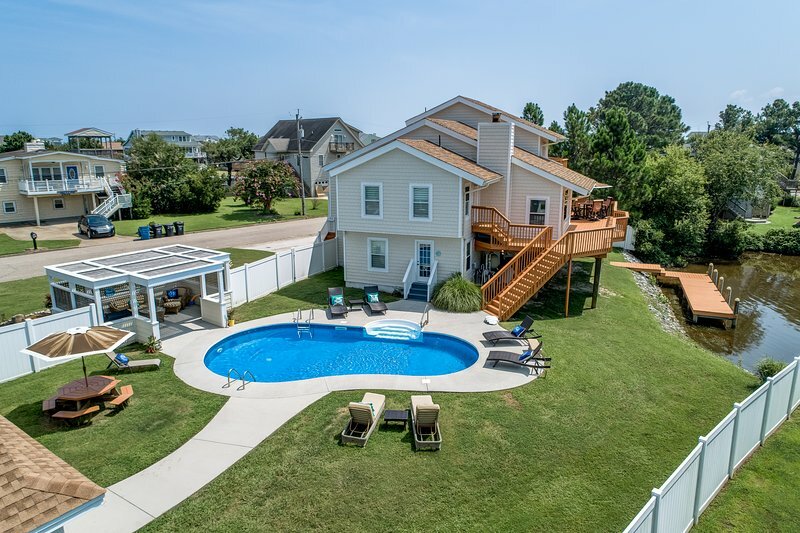 Extras: Private Pool (30 x 16), Wireless Internet Access, 3 Full Size Refrigerators, Dock, No Smoking, Dogs Allowed, Parking: 4 Cars, Distance to the Beach: 3010 ft. Additional amenity details: Private pools are open from May 3, 2019 until October 6, 2019. This property is not equipped for pool heat. Pool heat is not an option for this property. Owner has personal watercraft locked and secured (not for guest use). Fireplace seen in photos is non-functioning and not available for use. All Sandbridge Blue properties provide bed linens, bath towels, beds made prior to your arrival, and a starter supply of: toilet paper, bathroom soap, paper towels, and dishwater detergent.